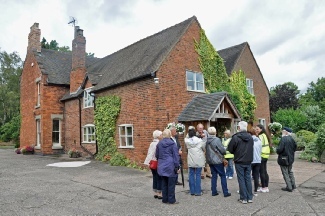 As part of our policy of showing our members what the villages of the Tamworth District have to offer, TDCS had a most enjoyable visit to historic Drayton Bassett on Saturday, 20th August 2016 as guests of Drayton Bassett's ninety year old Womens Institute, and other villagers. Drayton figures in the Domesday Book of 1086 and is particularly associated with the owners of Drayton Manor through the centuries. 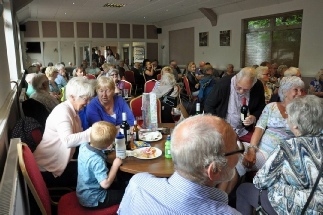 We had to restrict our numbers due to the nature of the event and the capacity of venues, but 47 members and their friends managed to secure the coveted places. The W.I hosts and villagers took our group up to around 70. We assembled for refreshments in the W.I. 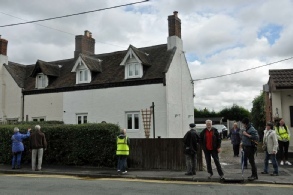 Hall and then split into three groups for a guided walking tour of the village organised by the W.I.. Each group was welcomed in turn by villagers at four local homes to learn the history and admire the architecture and original features, including one of the famous Back to Front houses, allegedly laid out so that villagers would not stand and stare at the Peel family of Drayton Manor as they rode through the village. "The Croft" dates from Georgian times. 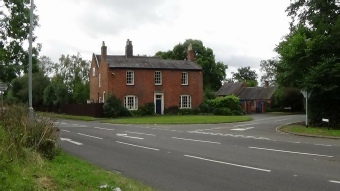 We learned that impressive Drayton House is two houses joined together - the 1796 original was extended at the front in 1822 to create the gentleman's residence that stands prominently at the entrance to Drayton Lane. At Bullocks End Farm we went into the farm shop that is a hive of activity each Christmas. At "Tristmas Cottage" in New Row the proud owners took us into every room of their Victorian gothic home and all around their garden. 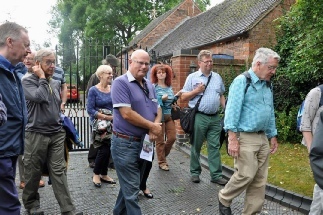 In the historic parish church of St. Peter, where Tamworth's most famous son, Prime Minister Sir Robert Peel, lies buried under the nave, members admired the Peel memorials, and learned about the new peal of bells shortly being installed in the 15th Century tower. Then everyone - TDCS, W.I., and village hosts - poured into the Drayton Village Hall (the W.M.C.) for a buffet lunch and a marvellous raffle with lots of prizes. 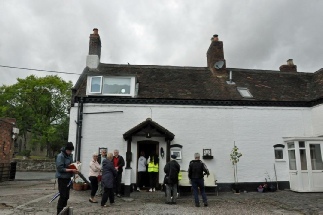 It has to have been one of the most relaxed and sociable events TDCS has held, and the poor weather kindly relented for the duration of our visit! 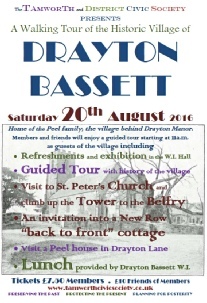 Thank you to all concerned at Drayton Bassett for making us so welcome, and to our very well-organised guides. Single File! 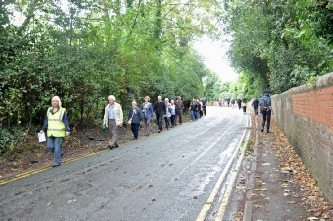 Groups A and C pass each other in Drayton Lane under the careful watch of their fluorescent Guides! Farmer Hemus welcomes Group C to Bullocks End Farm which his grandfather purchased from the Peel Estate in 1926. 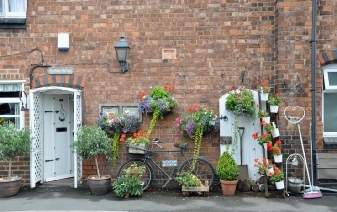 Pretty as a picture "Tristmas Cottage" in the Victorian terrace of New Row, built by the Peels. 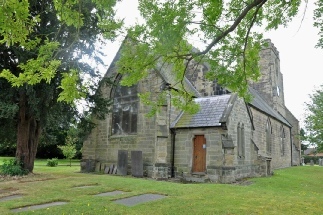 The Parish Church of St Peter. Final resting place of one of Britain's greatest prime ministers. Check your raffle tickets! Lunch and cameraderie in Drayton W.M.C. between TDCS, the W.I. and villagers crowned a lovely event. Group C at the rear of The Croft. One of the "Back to Front houses". The frontage of The Croft - with no front door!